Last night I made a marvelous pizza, if I do say so myself. 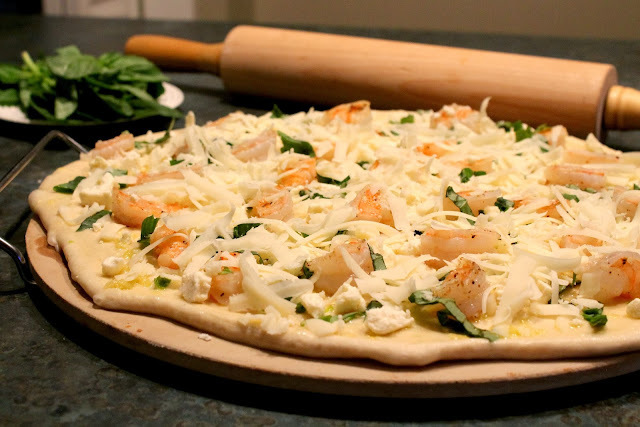 This spring I posted this recipe for a Garlic Basil Shrimp Pizza. I think I forgot how tasty this actually was until we made it again last night. I buy my pizza dough pre-made from the grocery store, and its less than $2.00. We can get two meals out of it, so it's a pretty cheap dinner. 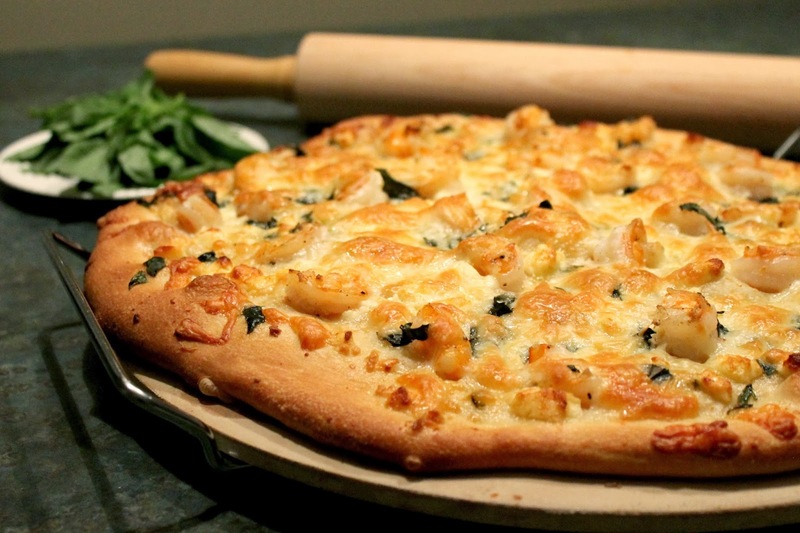 If you didn't catch my previous post with the recipe for this pizza, I have added it below. Let your dough sit out for 30 minutes to an hour to get to room temperature. Preheat oven to 400 F. Grease a round cookie sheet or pizza stone. Roll out your dough with a rolling pin to cover the entire pizza stone. If the dough is sticking, lightly coat the rolling pin with flour. Mince the garlic and spread evenly over the crust. Pour the EVOO on top and spread it around the dough using the back end of the spoon. Meanwhile saute the shrimp with salt and pepper and a teaspoon of EVOO over medium high heat until just opaque. Place them evenly over the pizza, top with basil, feta, and mozzarella. Bake for 18-20 minutes on the bottom rack of the oven. This looks amazing! Where do you find such fresh looking basil in January? This looks absolutely delicious! I'm definitely going to have to make it soon - and I think it would be really good with sundried tomatoes, too! I can't eat shrimp, but this looks SO good! Gosh that looks good - I cannot wait to try this!